Is My Idea Fit to Become a Nonfiction Book? 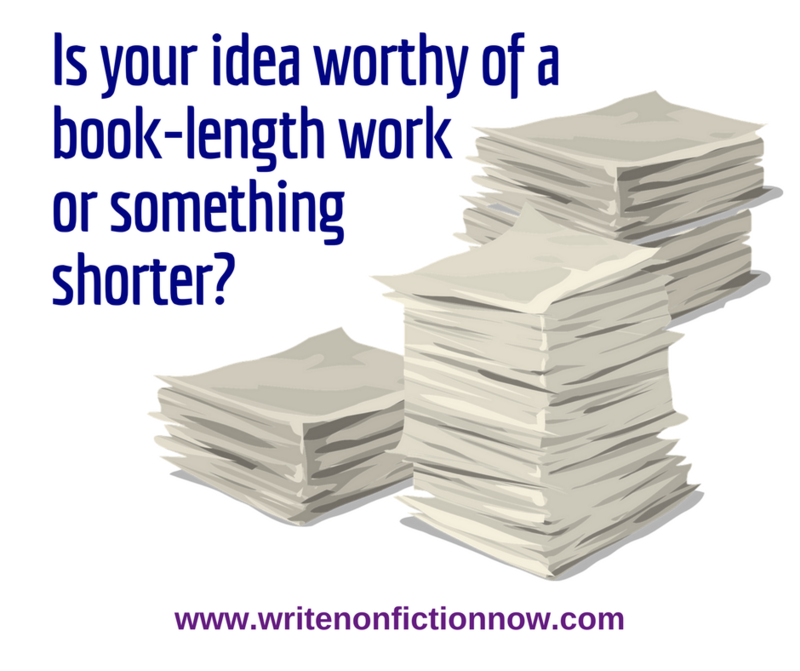 - Write Nonfiction NOW! Is My Idea Fit to Become a Nonfiction Book? Not all ideas are fit to become books. 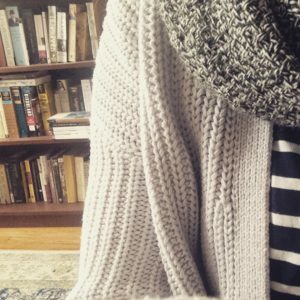 In this guest post, book editor C.K. Bush (@theladyck) offeres important distinctions that help writers determine if an idea should become a book or would be better served as a blog post or article. Before you decide to write a book, you need to determine if the topic you want to explore is even suited to book form. Not all topics are served well by a book format—and knowing when a topic is a better fit for an article or blog post—or should be tabled—contribute significantly to the readability and reception of your writing. I’ve previously discussed how to make your book shorter and longer. These techniques work if you know what you want to write and that what you’re writing is, in fact, a book. Additionally, the following five questions will help you consider the main things issues relevant to choosing whether your ideas is fit to become a book. 1. Does your idea have a visible narrative? Narrative is a pretty basic feature of any book, and it seems like it might be too obvious a question to ask. However, you’d be surprised by how many nonfiction books are written without a sense of narrative. Narrative is easy to see in a book like Killers of the Flower Moon, which has a historical and investigative component, or a memoir like Wild. But, even less traditionally narrative subjects have a simple narrative when published in book form. This narrative might be considered the book’s structure. A book of parenting advice, for instance, might be structured in order of stages of a child’s life, and this structure will give the book a basic sense of narrative. A book on a more complicated subject, like food security in Africa, might be structured around the things we need to progressively understand to comprehend food security, such as history, politics, local economies, and the world economy. This kind of narrative isn’t chronological, but it is logical—it’s a structured set of ideas that the reader can follow. If your topic can’t be fitted to a narrative like this, it’s not suitable for a book. In fact, without a narrative, a topic likely is going to be hard to fit into any long-form writing. Instead, consider turning it into a blog post or going back to the drawing board. If your topic can’t be fitted to a narrative, it’s not suitable for a book. 2. Is the narrative equally weighted? So your topic has a narrative, but is it a strong enough narrative? I’m not speaking about quality here, though having a compelling story is a major plus for any writing. A book-length narrative has to sustain itself over a period. If you have a lot of story for the beginning and end but have to gloss over the middle due to a lack of events in between, then a book might not be the best format for your idea. The same thing goes if you are interested in writing about a particular aspect of the story and feel yourself rushing through or skipping over other parts. That’s a sure sign that the real story lies just that one part, which may lend itself better to a shorter piece of writing. A book-length narrative has to sustain itself over a period. 3. Can you identify a unifying theme? A theme is as crucial as a narrative for holding a book of disparate chapters together. Other terms used to describe a book’s theme are argument or through-line. The narrative might be the life-changing events of your first year of college, but the more significant theme resonating in each chapter might be that your newfound independence led you to make the choices you did. The book may be tracing the components affecting food security in Africa, but the through-line connecting the chapters might be that historical conflict is the biggest factor affecting food security in the region today. If you can’t figure out the theme for your idea, you might need to dig deeper into your topic or consider scaling it to a smaller piece of writing where the theme becomes more apparent. A theme is as crucial as a narrative for holding a book of disparate chapters together. 4. Does the topic have sufficient complexity? If you look at the hypothetical book examples I’ve come up with so far, you’ll notice that they are all big, expansive topics: African food security, freshman college memoir, and parenting advice. Roomier topics are a good match with a longer format like a book. Very specific topics can lead to extremely boring books. Consider a narrower version. Would you want to read a book exclusively about the political reasons for food insecurity in Botswana, a book-length memoir about an eighteen-year-old making out with a frat boy, or a parenting book specifically on the best educational toys for toddlers? Topics like these are better suited for a smaller essay or article. If you want to write a book and have a lot of material on a narrower topic like one of these, take a step back and think about what other material you’ll need to gather to expand the topic into a more general one. Doing so might require more research, but in the end, you’ll have a better book. Very specific topics can lead to extremely boring books. 5. Are your conclusions big enough for reflection? When you’re planning to write a book, make sure to ask yourself: so what? Who cares about this topic, and why should they? These questions shouldn’t be challenging. Your book should speak to a big idea and contribute to the broader conversation going on around your topic. The “so what” is easy to find in our hypothetical books on African food security or parenting—you can argue that your findings add new information or techniques to the body of literature that already exists, and that it’s important to know more about these crucial topics. But even books that aren’t as sweeping or grand as these should still hold up to the “who cares” standard. A memoir might speak to something universal we all go through or a current political debate; a biography might bring someone who has been overlooked to the public’s attention. Any type of writing ideally gestures to the bigger picture, but a book especially so. Without such consideration, a book will fall flat or possibly feel like a waste of the readers’ time. These main components of a book are definitely boxes you should check off as you flesh out your initial idea. If you miss the mark, don’t worry. Articles and essays are an excellent form of writing all on their own, and there is a robust market for publishing these shorter works. The same goes for blog posts, like this one. Further, shorter pieces of writing can sometimes develop into books later on. So, if your idea now seems more suited to an article, you may find that the finished product opens the doors for you to expand upon your ideas, research further, or think of new connections that round out your narrative and conclusions into an idea worthy of book form. And if your topic is not quite right for a shorter piece of writing but not fully formed enough for a book, don’t despair. You’ll have to do some digging and re-conceptualizing, but the effort will pay off in a great book that people will be excited to read—and a publisher will be happy to publish. How do you know our idea is fit to become a book? Tell me in a comment below. C.K. Bush is a nonfiction editor and writer. She lives in New York City.